This two-sided, mobile locker unit is ideal for backpack storage. Each side has 10 sections (20 in total). Each individual section is 11” wide x 13” deep x 21” high and contains a top-mounted, double coat hook. 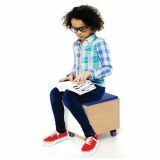 The 4" locking casters allow the mobile backpack cubbie to glide in and out of the classroom. Stylish and versatile storage cabinet with a clever fold-down workstation door for today's teacher! Part of our Whitney Brothers® Teacher's Collection, this stylish cabinet features three distinct sections that each satisfy the diversity of a teacher's storage and utility needs. The top section features a large open storage compartment [17.25"D x 35.25"W x 15.75"H] for oversized items behind left and right exterior doors hung on two strong European soft-close hinges that prevent slamming and keep fingers from getting pinched. The middle section features an exterior door mounted horizontally on a single continuous piano hinge and two special brackets [one left, one right] that enable the door to open vertically and provide a convenient working surface for a keyboard, electronics or writing area that will support up to 100 lbs. Inside, the left area features a single storage compartment [17.25"D x 22.5"W x 15.75"H] with a portal to accommodate cords and cables, and the right side features a divided storage section [12"D x 12"W x 15.75"H] with a single adjustable shelf. 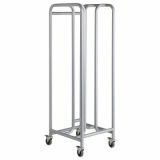 The bottom section [17.25"D x 35.25"W x 30.25"H] features a full width adjustable upper shelf over a bottom fixed shelf that provides flexibility to accommodate any storage need. All cabinet handles are satin nickel finish that match the WB-1809 Teacher's Desk With Trays and Locking Door, WB-1810 Teacher's Wardrobe with Trays and Locking Door and WB-1811 Teacher's Rolling Stool with Trays [each sold separately] in our exclusive Teacher Collection. Wall attachment brackets and floor glides included. Constructed with no visible screws or joinery for a fine finished furniture look in beautiful, durable birch plywood and safe, non-toxic natural UV finish that won't yellow and withstands rigorous use. Ships fully assembled by Truck. Made in USA. GreenGuard™ Gold certified. Lifetime Warranty.